I witnessed a violent assault this evening on the subway. I don’t know how this stuff just follows me. Usually, I witness silly or strange things, but this was different. And it could have been worse. I was on the C train, heading up from Chambers Street to Penn Station to catch the LIRR. This story requires a visual aid. You may know I am a big fan of crude drawings. So here is a crude drawing of the scene on the train. At the next stop, a guy got on the train, and stood in the doorway across from me. He’s labeled, “SMART GUY.” Deranged Person turned to the smart guy and started yelling at him. “GET THE F*** AWAY FROM ME. GET THE F*** AWAY FROM ME OR I’LL KILL YOU.” Smart Guy didn’t need any further prompting. He knew what he was dealing with. A deranged lunatic. He looked at the guy and walked to another spot in the train car. At the following stop, more people got on. A guy in his 20s, who I labeled “UNFORTUNATE GUY,” boarded and stood in front of Deranged Person. He was wearing a tank top and was in very good physical shape. Deranged Person looked up at him and screamed the same types of obscenities he’d hollered at the smart guy. Unfortunate Guy, however, didn't walk away. He stood his ground. I don't know what I'd do in that situation. The train was more crowded now, and the guy SEEMED harmless. Usually the loud ones are. Where was Unfortunate Guy going to go? Deranged Person stood up and grabbed Unfortunate Guy by the throat. The guy labeled PEACEMAKER, who also happened to be a pretty big man, got right in between them and started yelling at Deranged Person to back off if he didn’t want to get arrested tonight. Maybe he was a cop. At the next stop, Peacemaker physically removed Deranged Guy from the train. We all congratulated Unfortunate Guy for keeping his cool. That's a lot harder than blowing your stack and escalating the situation. Deranged Guy was apparently dead serious, and must have had real assault intent, because Unfortunate Guy was bleeding from his neck and his shirt was ripped. Another passenger gave Unfortunate Guy First Aid, and I got off at the next stop. What’s the moral of the story? I have no idea. Be careful. 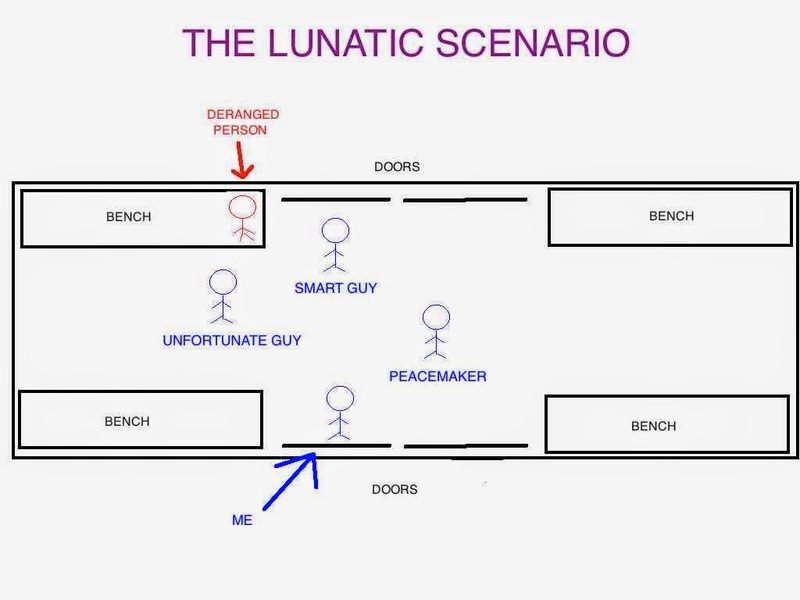 Lunatics aren’t worth it. Don’t let pride get in the way of your safety.